Fusion foods are quite tricky, aren't they? They can go right or wrong and more often than not, they do go wrong. Especially when you try to combine an American breakfast dish with a South Indian favourite! Chef Balaji, though, has pulled it off!!! 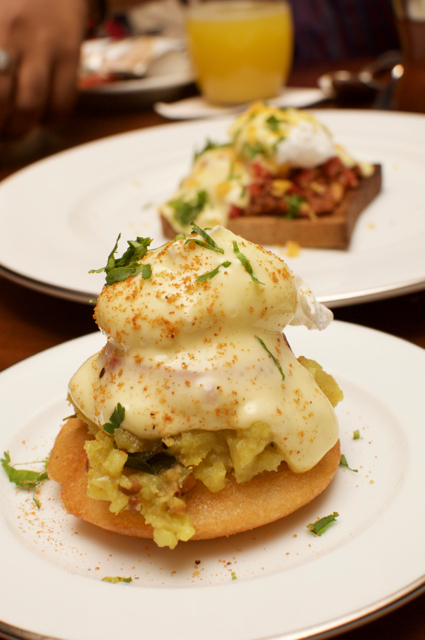 A twist to the Egg Benedict with fried idly with gun powder, masala and the hollandaise sauce on top of a runny egg! It was South Indian on a plate and could have passed off as a pure South Indian dish! So, four of us set off for breakfast!! I am sucker for it and a sucker for sleeping late on Sunday, so I was torn between two loves! Every Sunday I surface well past evening, so why not give breakfast a chance on Sunday too! Being someone who advocates breakfast for healthy living, Sunday need not take a break. Boy, was I glad! 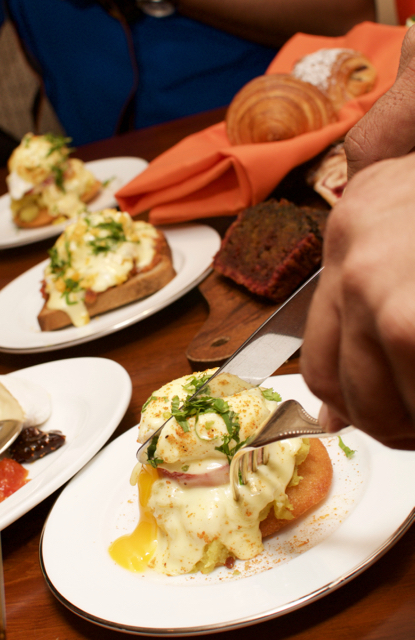 They have an Eggs Benedict festival going on and you can choose among five types of Egg Benedict twists! And these are part of the breakfast with no extra charge, so thats awesome too. Park Hyatt's Berry Muesli is top notch and that set the tone for the rest. While the spread is not huge, there is variety in the little that is there. 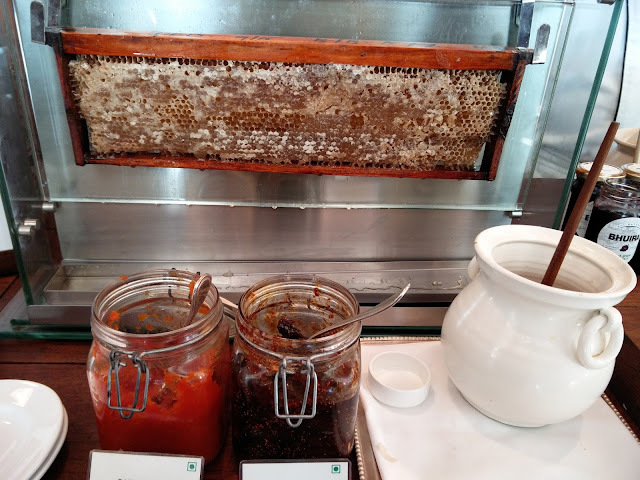 That with a live honeycomb, some awesome fig chutney and the likes, breakfast was getting simple and special. All this before the Eggs made their appearance. Being a group gives you the freedom to keep ordering variations as there are people to gobble them up. 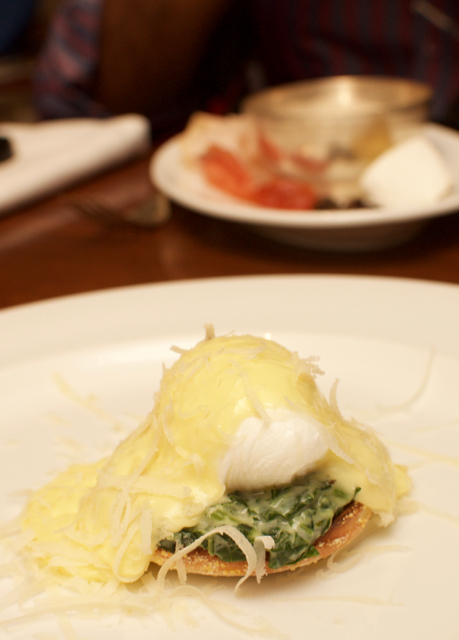 The first to arrive was a classic version, on an English muffin with spinach and hollandaise sauce. Lovely start. And then came the bangs of flavours. A South Western with baked beans was next and this had lovely Mexican-y, South American-y, Breakfast-y flavours on a toast!!! 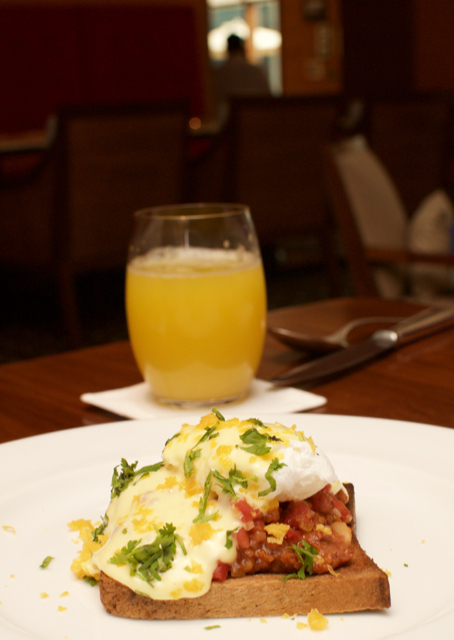 Then a continental version that had a corn patty topped with the egg Benedict!!! This was slight miss as it was rather soft as a whole and missed a little crunchy element. And then the most interesting of them all, the South Indian! It was fantastic large fried idly, topped with the gun powder, some masala (potatoes that go into the dosa) and then topped off with a runny egg Benedict and the hollandaise. The combination of the hollandaise with the South Indian flavours were excellent, but it is something you may either love or hate! I was the cat on the wall till my second bite and then I fell in love with it! The fifth one is a waffle with egg Benedict on top with option bacon for the bacon lovers!!! Besides all of the Eggs Benedict, I was biting into a crunchy-on-the-outside-and-soft-inside croissants after God knows how long! It was simply perfect. 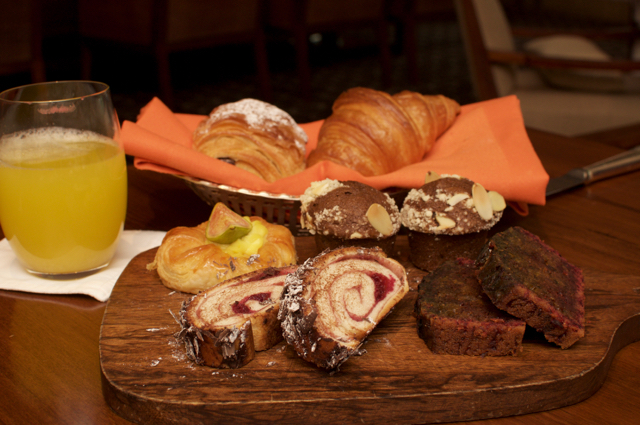 Just those croissants with Eggs and we could be done for breakfast! Priced at Rs 900 plus taxes (ends up being Rs. 1150 something) and no extra charge for the Eggs, this a how a breakfast should be - King, but on quality, not quantity! The Eggs benedict festival is on till the 31st, but I really hope they add a couple of them into their regular breakfast!! !